EDIT: Giveaway is officially closed. Congratulations to Michelle for submitting the randomly chosen 796th entry. 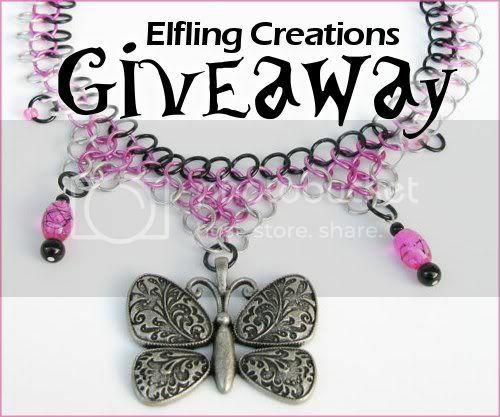 Anyone can still get 10% off to Elfling Creations by using coupon code "GIVEAWAYELFLING12" during checkout before May 31, 2012. Many Americans may dread mid April because of Tax Day, but Meri of Elfling Creations has a reason to rejoice. April 16th marks the 5th year since she opened her Etsy shop. To celebrate her Etsyversary with her fans, she's giving away a $25 gift card! The winner may have a tough choice deciding what magical accessory to spend it on. I'd choose the pink and black butterfly chainmaille necklace above in a heartbeat, but that's because I already own a pair of her costume dragon horns and crocheted elf ears, which you can see me wearing in my FaerieCon 2009 collage. Meri makes pretty much anything if she can get her hands on the supplies. She began creating jewelry as a child, stringing plastic beads into necklaces for her mom and sister. Her latest addiction is chainmaille and weaving wire - in addition to amazing necklaces, she also offers elven armor slave bracelets and cartilage chain earrings in a variety of colors and whimsical charms. Sculpting and crocheting are her other two mediums of choice. She was taught the single stitch about five years ago, and has been learning and experimenting on her own since then. Her crocheted ears and arm bracers are fun ways to embellish Renaissance Faire costumes, but her little plush dolls are even cuter! Out of her many fantasy art creations, what would you choose? Use the Rafflecopter below to enter to win Meri's jewelry giveaway before 11:59pm EST on April 25, 2012. I adore the Green and Brown Trees Embroidery in Handpainted Hoop Frame! My fav item is the Crocheted Elven Costume Bracers!! I love the silver feather dangle ear cuff! I love the Triquetra Celtic Knot Chainmaille necklace! i think the Chainmaille Black and Silver Key Necklace is pretty(everything is pretty though)! I love the Chainmaille flower necklace in blue, gold, and black - Periwinkle Princess. I like the Blue and Silver Chainmaille Bracelet. Love the Blue and Silver Chainmaille Bracelet-gorgeous work. I love the Brown, Green and Yellow Cartilage Chain Earring - Lucky Coin! I like the Blue and Green Stretchy Chainmaille Bracelet. I like Silver Feather Dangle Cartilage Ear Cuff. I love Chainmaille Black and Silver Key Necklace!! I love the cat ears! i love the red & silver pirate keychain! I like the silver and purple butterfly ear cuff. Thanks for the chance. favourite item - Blue D20 Dice Keychain - Castle of the Clouds. Christina - xristya@rock.com - Gold and silver snowflake necklace! Love the Black and Silver Rubber Chainmaille Bracelet! I love the silver and black white tree earring! WOW!!! I love the Green, Gold and Silver Turtle Chainmaille Necklace - Terrific Terrapin...Gorgeous!!!! Blue and Silver Chainmaille Bracelet for sure. Everything is beautiful though! The Tree Embroidery is adorable! This style is wicked cool. My favorite item is the Chainmaille Gold and Silver Snowflake Necklace - Winter Princess. I love the fox embroidery hoop! 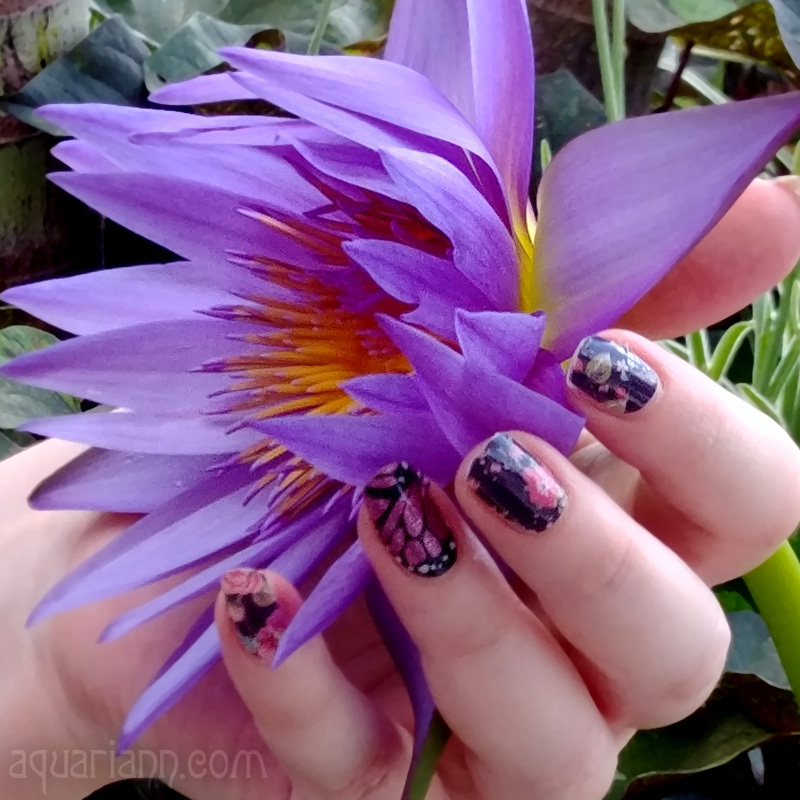 My favorite is one I already own - a custom doll she made of my dnd character, but I also really want to get one of her hand flowers. I love the Blue and Green Stretchy Chain mail Bracelet. Blue is my husband's color and mine is green so I love to find anything that mixes the two. Thank you for the opportunity to win! I like the Green and Pink Double Cartilage Chain Earring - Flower Fairy. Very pretty. I love the Gold Metal Feather Cartilage Ear Cuff!! My favorite thing is the green and brown trees embroidery. 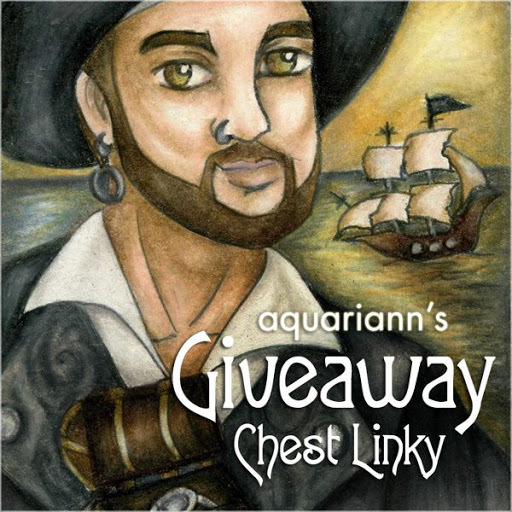 - Judith R.
My favourite piece is the Chainmaille Black and Silver Key Necklace. I love the Silver and Blue Green Cartilage Ear Cuff - Turquoise Dragon... I've been looking for a nice earcuff lately and this is just lovely. I like the Elvin Costume bracers. I really like the Chainmaille Gold and Silver Snowflake Necklace. I love the Silver and Blue Wing Chain Ear Cuff - Aerial Angel. luv their green, brown 'n yellow earrings. Chainmaille Gold and Silver Snowflake Necklace - Winter Princess, Thanks! The Chainmaille Gold and Silver Snowflake Necklace - Winter Princess looks great! I LOVE the silver and green celtic knot ear cuff! OMG love love love the Green and Brown Trees Embroidery in Handpainted Hoop Frame!!! It would go perfectly with my nature themed bedroom!!!! I really like the Brown and Green Rubber Chainmaille Bracelet. I like the Chainmaille Gold and Silver Snowflake Necklace - Winter Princess. It is so beautiful! I love the blue and silver cartilage chain earring!